Blum and their Dynamic space systems allow us to create spaces that are hi functional, easy to use and all in the knowledge that they will last the test of time. Below is a article from the Blum Australia website, refer to link below to see more on these incredible products. These images have been shot at our recent Bondi project. 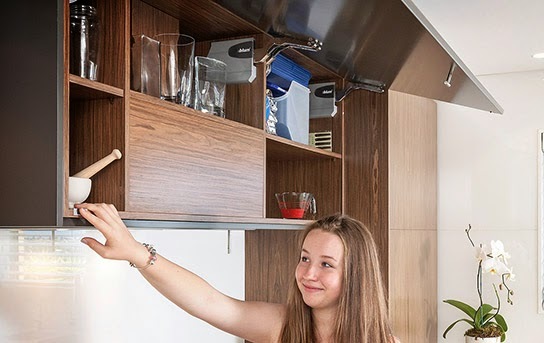 "Some swing in the kitchen"
The overhead cabinet with AVENTOS HK up and over lift system fitted with the electrical SERVO-DRIVE was designed as one horizontal operable door that opens with a single touch on the front. "To close, I just have to press a button and it closes automatically. No way to bump may head on a door corner. ", Janelle explains pleased. A second specialty cabinet required was a pastry workstation stocked with baking ingredients, equipment and a work surface. Under bench TANDEMBOX intivo drawers selectively fitted with ORGA-LINE utensil compartments – a place for everything and everything in its place. "This kitchen will last for years"
A hard working kitchen requires top quality products that stand the test of time and backed by company guarantees. Janelle and Antony wanted the real deal and the confidence that the hardware in their kitchen would maintain its high standard of quality for the lifetime of their kitchen.